Monologues are important items in an actor’s tool kit. Most audition situations require an actor to deliver a monologue as part of the casting process. That short burst of words—usually between one and five minutes in duration—is often the determining factor for whether or not the performer gets the job. Professional actors often have several monologues memorized, polished, and ready to perform at the crackle of a contract. The choices are usually classical, contemporary, humorous, and serious. Students and beginning actors are seldom similarly prepared. They comb the pages of plays to find speeches that are long enough to fit the time requirement of a specific audition and dramatic (or funny) enough to show off their skills. The theater section of the local bookstore or library may have half-a-dozen or more compilations of monologues just waiting to be swallowed whole. Of course, these eager actors hardly ever know whether the literary morsels they are chewing are appropriate for the situation. 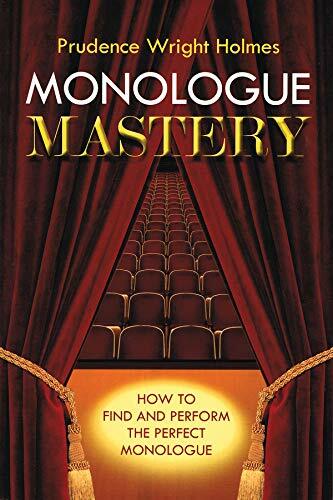 Holmes’ book offers a clear and helpful roadmap to the land of successful monologue choices. Holmes knows the subject well. In fact, she has been dubbed, “The Monologue Detective” by her students and fellow professionals. She is a veteran actor whose stage credits include a number of appearances on Broadway, and who has worked frequently in films and television. She has also taught acting and coached actors for more than 25 years. One of the strengths of Monologue Mastery is the author’s obvious liking for the people for whom she is writing. The book is as much an acting guide as it is a guide to finding and delivering successful monologues. Some of the information will be useful to working actors as well as beginners and students. Holmes guides the reader through a process that begins with finding the right material and continues through preparing the delivery of the material. She also gives valuable advice about preparing the actor to give the best possible audition and how to keep a businesslike journal with notes about every audition attended. Audition judges who read the book will sigh with relief at the thought of never having to sit through another rendition—no matter how good it is—of a passionate speech from the play Equus.